Bow Valley College is the largest provider of English language instruction in Alberta. Looking for LINC classes? Bow Valley College offers a range of in class and online classes in Calgary and the region. Are you LINC eligible? Bow Valley College is proud to offer LINC Career Services and the LINC Work Readiness Training Program. Bow Valley College is the largest provider of English language instruction in Alberta, offering a range of full-time and part-time programs from beginner to advanced levels. The School of Global Access offers ELL programs that help learners to live, study, and work in Canada. We are proud to offer Language Instruction for Newcomers to Canada (LINC). Bow Valley College offers a range of in class and online LINC classes, as well as LINC Career Services and the LINC Work Readiness Training Program. You can access information in multiple languages: English, French, Spanish, Arabic, Chinese, Persian, and Urdu. Come visit us to apply today. It’s time to take the next step on your English learning pathway! Why Study English at Bow Valley College? When you study English at Bow Valley College, you join a community of people from around the world. As the largest language provider in Alberta, we are a recognized leader in English language learning. Our programs help you develop the language and intercultural skills that you need to achieve your career and educational goals in Canada. Learners choose Bow Valley College because of our well-respected reputation, welcoming community, and our highly qualified instructors and staff. Bow Valley College is a great place to learn English. Just ask our learners. You can read information about all of our English language programs here. Use the filter buttons to read about specific types of programs. Do you want to attend full-time LINC classes? Have you completed 10 or more years of education outside of Canada? Do you want to attend part-time LINC classes? Have you completed 10 or more years of education outside of Canada? Do you need to improve your academic English to attend post-secondary programs in Canada? Are you between the ages of 18 and 24 years old and have completed high school? Are you between the ages of 18 and 24 years old and have not finished high school? Do you want to attend full-time LINC classes? Have you completed 5 to 9 years of education outside of Canada? Do you want to attend full-time LINC classes? Have you completed 0 to 4 years of education outside of Canada? Do you want to attend full-time language classes? Have you completed 10 or more years of education outside of Canada? Do you want to attend full-time language classes? Have you completed 5 to 9 years of education outside of Canada? Do you want to attend full-time language classes? Have you completed 0 to 4 years of education outside of Canada? Do you want to attend part-time LINC classes outside of Calgary? Do you want to study a LINC course from home? Do you want to take a LINC reading or writing course online? Do you want to attend part-time language classes? Do you want to study online? Are you 55 or older? Do you want to practice your English language skills? Do you want to attend part-time English courses outside of Calgary? Do you want to visit Canada to study English? Are you a skilled professional immigrant with no Canadian work experience? Are you a LINC learner thinking about getting a job after your language classes? Are you LINC eligible? Would you like to access career services? These services are funded by Immigration, Refugees and Citizenship Canada. Bow Valley College is proud to offer Language Instruction for Newcomers to Canada (LINC). LINC is funded by Immigration, Refugees and Citizenship Canada and supports adult newcomers who are permanent residents or who have Convention refugee status. At Bow Valley College, we offer full-time and part-time LINC classes at a range of levels, including very basic classes for those who have little or no English skills. We have LINC for work, including LINC Career Services and the LINC Work Readiness Training Program. We also offer LINC Home Study, Online LINC, and LINC classes in the region. For more information about LINC, watch this video prepared by Immigration, Refugees and Citizenship Canada. Bow Valley College is proud to offer permanent residents and Convention refugees access to LINC Career Services. LINC Career Services is funded by Immigration, Refugees and Citizenship Canada. For more information about requirements and services, see LINC Career Services. The LINC Work Readiness Training Program helps LINC eligible newcomers with work experience find employment in their field. The training is a combination of in class instruction and a work placement. For more information, see LINC Work Readiness Training Program. Each year, thousands of language learners choose to study English at Bow Valley College. Our variety of English language learning programs, taught by highly qualified instructors, means that we have the right program for you. 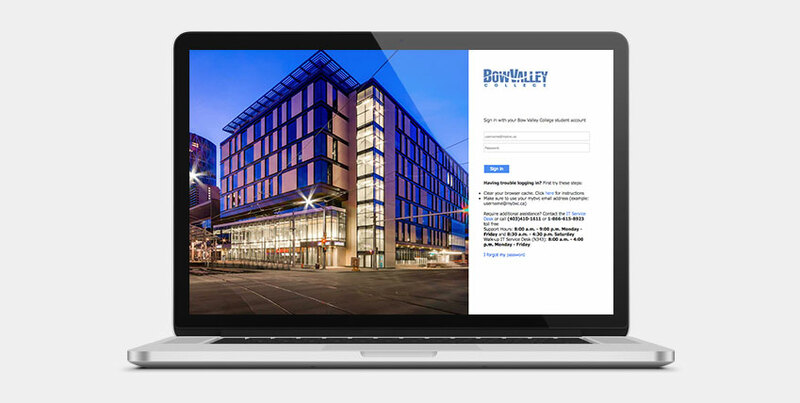 To get started, visit our Prospective Student Centre at our South Campus in downtown Calgary and Bow Valley College staff members will help you apply. Do you want to come to school full-time or part-time? What is your educational experience outside of Canada? What is your work schedule? You can bring a friend or family member with you to help you discuss the application process with our friendly staff. You may also need to bring other identification, a recent language level assessment, or other immigration documents. For information about the specific documents that you will need to bring, see ELL Applying. If you are an international student and would like to study at Bow Valley College, please see International English Language Learning for specific information about your application process. Bow Valley College is proud to offer Language Instruction for Newcomers to Canada (LINC). LINC is funded by Immigration, Refugees and Citizenship Canada and supports adult newcomers who are permanent residents or who have Convention refugee status. For more information, see LINC at Bow Valley College. We will help you with the LINC application process. Come and visit us, or attend one of our LINC Application Days. For upcoming LINC Application Days, see ELL Applying. See the timeline to learn more about the documents you need to bring with you and the LINC application process. Your CLB results must be less than 12 months old. CLB tests and referrals are available from ILVARC through Immigrant Services Calgary. * For information about the immigration documents that you need to bring, see ELL Applying. Bring everything you need to one of our LINC Application Days. For upcoming LINC Application Days, see ELL Applying. You will receive a communication from us telling you if you are on the waitlist or if you are accepted. If you are on the waitlist, we will contact you if a seat becomes available. This could happen between the time you receive the communication from us and the start of the next term. If you are accepted, we will confirm your schedule and provide details about how to log into your MyBVC account. If you are accepted, keep checking MyBVC for important information. If you are on the waitlist, we will contact you if a seat becomes available. If you are accepted into a LINC program, you will start on the first day of class. If you are still on the waitlist two weeks after the start of term, you will need to confirm if you would like to be on our priority waitlist for the next term. What day do classes start? Our English language programs have different schedules and different start dates. See English Language Programs at Bow Valley College and select the program you are interested in for specific start dates. Are there places available in your English language classes now or next term? Bow Valley College offers a variety of part-time and full-time English language learning programs at a range of levels every term. Can I apply for ELL programs online? For many programs, you will apply in person at a Bow Valley College campus. Select a program from English Language Programs for specific application information. Language Instruction for Newcomers to Canada (LINC) is funded by Immigration, Refugees and Citizenship Canada and supports adult newcomers who are permanent residents or who have Convention refugee status. Learn more about LINC at Bow Valley College. I have applied for English classes at Bow Valley College. When will I receive more information? If you have applied for LINC classes, you will receive a communication from us a few weeks after attending the LINC Application Day. This communication will tell you if you are accepted or if you have been placed on the waitlist. See Prepare to Apply for LINC Programs for more information. If you have applied to an ELL program that is not LINC, we will email you to confirm your application status. If you are registered in a program, we will email you details about your MyBVC account. Please check your MyBVC account regularly for communications from us. I am registered for English language classes at Bow Valley College. When will I receive more information? Once you are registered in an ELL program, we will send important information to your MyBVC account. Please check your MyBVC account regularly for communications from us. I am on a waitlist. What happens now? If you are on a waitlist, you may get a seat in the upcoming term. We will contact you if a seat becomes available. If you are on a LINC waitlist, see the timeline at Prepare to Apply for LINC Programs at Bow Valley College for more information. If you are on a waitlist for a program that is not LINC, and do not get a seat in the term that you applied for, you will need to apply again. Learn more about preparing to apply for ELL programs. My friend and I came to apply on the same day. They are registered in a program and I am on the waitlist. Why am I on the waitlist? There are many possible explanations for this. You might be on a waitlist due to the number of people that have applied, your program choice, your recommended level, or schedule availability. When our classes are full, we place learners on waitlists. I think I am eligible for LINC, but I don’t have my Canadian Language Benchmarks. What do I do? You need current Canadian Language Benchmarks (CLB) results to apply for LINC classes at Bow Valley College. To book a Canadian Language Benchmark assessment, contact ILVARC – the Immigrant Language and Vocational Assessment Referral Centre through Immigrant Services Calgary. You can take a practice reading and listening test on the Canadian Language Benchmarks Online Self-Assessment website. This test is free and takes about one hour to complete. It is based on the Canadian Language Benchmarks (CLBs) and will help you prepare for your formal assessment. Can I get government funding for my program? We are a proud provider of the federally funded language training program called Language Instruction for Newcomers to Canada (LINC), and provincially funded programs such as Alberta Works. I am registered and need to change my program. What do I do? Does Bow Valley College have a daycare? There is a childcare centre at our downtown campus in Calgary. How do I get an Alberta Student Number? You can apply for an ASN at the Alberta Government website. I don’t live in Calgary. How can I learn more about programs in the region? We offer a variety of programs at Bow Valley College Regional Campuses and online. See English Language Programs above and select the Regional filter. If I am a full-time student, what will my schedule be? What happens if I become a Canadian citizen while taking LINC classes? If you become a Canadian citizen while you are taking LINC classes, you must inform us right away. In most cases, you will be allowed to complete your term/course. To continue with your English language studies as a Canadian citizen, you will need to select classes that are not LINC funded. Learners who are interested in applying for full-time ELL may apply for provincial funding. Can I get funding for my part-time ELL classes? We offer a variety of part-time ELL classes. Our part-time LINC classes are sponsored by Immigration, Refugees and Citizenship Canada. These classes are for adult newcomers who are permanent residents or who have Convention refugee status. For more information about our fee paying classes, see Part-time Language Skills Courses. How do I apply for International ELL classes? If you are not sure which program is right for you and you would like more information, or if you have questions about how to apply, we are here to help. Specially-trained Bow Valley College representatives will provide you with program and admission information, and can assist you in completing a Bow Valley College application.